Heat Things Up In These Red Hot Celeb-Approved Outfits! Hands down the sexiest color in existence. Queen P chose a cherry red dress by Australian label Nookie for a Super Bowl party. Don’t you love how she twinned with Miss USA Olivia Jordan? It’s totally possible to make laser cut fabrics and the color red look demure. Choose a midi length, style with soft hair, et voila! Do you have abs as defined as Anne’s? Steal the actress’ look with a flirty midriff-baring co-ord set in bold red. This full midi-length dress on Nadine Lustre brings to mind old Italian films and actresses like Sophia Loren. So glamorous! Few events call for show-stopping floor-length dresses, but Valentine’s Day is definitely one of them. 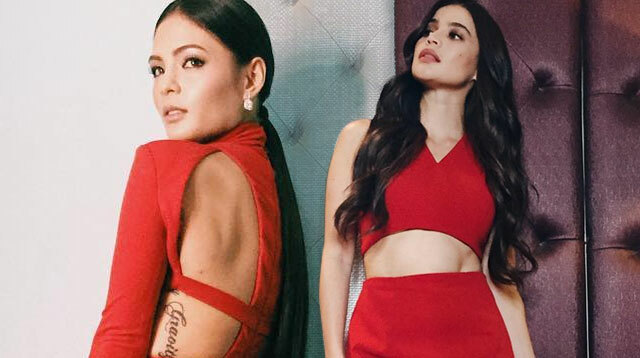 This backless one on Lovi Poe is a certified knockout. You can’t go wrong with a mini dress for date night! Choose one in red lace, and you’ve got yourself a winner. If we could, we’d wear off-shoulder tops and dresses all the time! So for a date with our special someone, it’s really a no-brainer. Skirts and dresses are standard date attire, but pants could totally work, too! Go for flowy fabrics and peek-a-boo details to keep it feminine.